I'm working on the Ramsay stack and had never tried to really learn it. 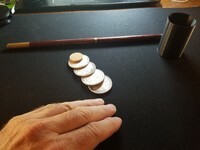 It seems it is taking a long time to perfect the coin vanishes and showing the tube empty ect according to the digital footage of my practice. Any one else seem to take a bit learning new moves or routines or am I just getting slower and older? Seemed when I was 25 I learned quckier. I love learning new things. i get better at learning as time goes by. i like the Carney version. As you get older you get slower,but wiser. As you get older.............. uh.......... I forgot what I was going to say??? Haha, I'm with you Mike! Like walking into a room with purpose ... and then forgetting why I went there. To get back to Zaviasdelita’s post: John Ramsey was a genius. But because he had rather “pudgy” hands (and I do not), most of his effects are beyond my ability. Nevertheless, I studied and learned a great deal about misdirection from his work. Also from Andrew Galloway’s two books about the misdirection techniques he learnt from Ramsey.